Made from sweet potatoes! Who would have thought sweet potatoes would make it past your plate and into a glass? We did. Together with our innovative spirit and commitment to not being wasteful, we brought the world its first shot of sweet potato vodka. 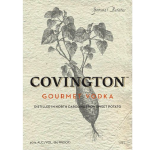 If you are a fan of fun drinks, visit the Covington Vodka site (www.CovingtonVodka.com) and learn a little more about its story, magazine features, and awards. And if vodka’s not your thing, well – you now have two fun facts to tell your friends. One, there is a sweet potato vodka. And two, you know where it originated! Be sure to watch this video from when we were featured on UNCTV!